The funeral services for fallen Cpl. Ronil Singh who was killed the day after Christmas was held on Saturday, where many remembered him as someone who launched a thousand laughs. Lili Tan reports. 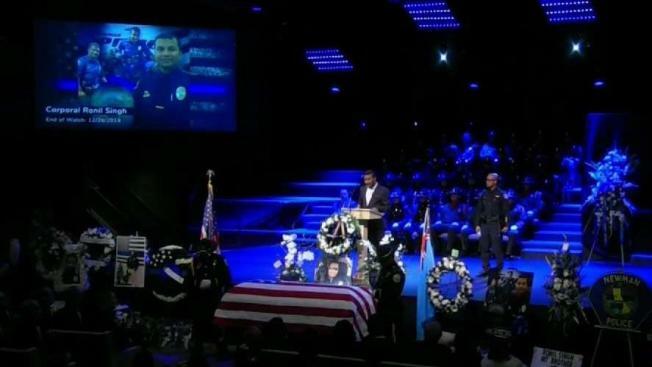 A California police officer who was killed in the line of duty was hailed Saturday as a "Fiji-born American hero" who made the ultimate sacrifice for his adopted country. At a funeral held for Cpl. Ronil Singh, mourners remembered the 33-year-old as a hard-working immigrant who worked his way up to become an officer in the small town of Newman. He "stood so much for what is right in our world and yet unfortunately was taken too soon from us by what is wrong in our world," Modesto police Officer Jeff Harmon said at the service in a Modesto church. He "probably more than anything else wanted to be home on Christmas night with his wife and his young son, but instead made a selfless choice to serve all of his community knowing that there are many more than just his own family that needed his protection that night." Singh was shot to death in the early hours of Dec. 26 after he pulled over a suspected drunk driver. The gunman fled, and a two-day-long manhunt led to the arrest of a man who authorities said was in the country illegally and was preparing to flee to Mexico. Gustavo Arriaga Perez, also 33, has since been charged with murder. The case has rekindled a debate over California's sanctuary law that limits cooperation by local authorities with federal immigration authorities. President Donald Trump has cited Singh's killing to call for tougher border security amid a fight with congressional Democrats over funding for a border wall. The impasse has forced a partial government shutdown that entered a 15th day Saturday. At his funeral, however, Singh's brother and colleagues focused on his achievements and playful personality. Singh grew up in a Fijian farming town and emigrated to central California in 2003. He joined the 12-member Newman police department in 2011 after attending police academy and serving as a volunteer, animal control officer and code enforcement officer at other agencies in the region. "He told me he came to this country with one purpose, and that purpose was to become a police officer," Newman Police Chief Randy Richardson said. "He told me about all the pride he had in America, and how much it meant to get this opportunity." Singh served as a K-9 officer before being promoted to a corporal at the Newman police department. He earned a bachelor's degree in administration of justice two years ago with the goal of becoming a sergeant, said his friend, Modesto police Detective Ra Pouv. "Ronil and I are both immigrants to a country we truly love, and we both view serving our country and community through law enforcement as important to who we are," said Pouv, who is from Cambodia. "It is our way of giving back to a country that embraced us and our family." The Fijian ambassador to the United States, Naivakarurubalavu Solo Mara, said Singh made his mark in his adopted country and called him a "Fiji-born American hero." Singh's widow, Anamika Singh, was at the funeral but did not address mourners; his 5-month-old son can be heard cooing during the service. A slideshow shown during service featured photos of the smiling officer posing for Christmas photos with his family, hanging out with fellow officers and cuddling Sam, his black Labrador K-9 dog. On Friday, his casket was draped in an American flag and driven about 25 miles in a procession from Modesto into a theater in the small town of Newman for a viewing. People lined up along the streets to honor the fallen officer. After Saturday's funeral, Singh's body was taken on a procession to its final resting place at Lakewood Memorial Park in the nearby town of Hughson.